Ad spending by U.S. retailers declined 4% in the lead-up to the 2018 holiday shopping season, according to estimates released this week by Standard Media Index. 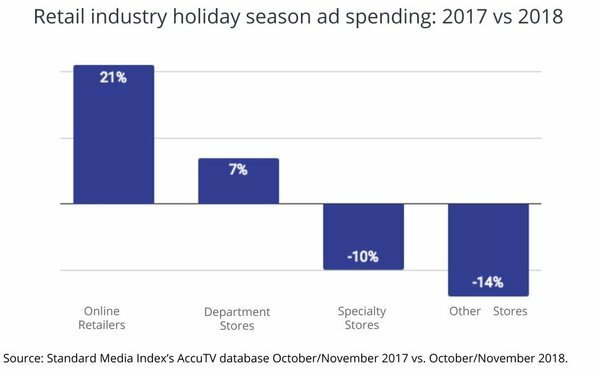 The data, which is derived from SMI’s AccuTV database, and presumably represents only TV ad spending, is for the months of October and November 2018 vs. the same months in 2017. While overall retail advertising was down year-over-year, the online retailing category rose 21% and traditional department store advertisers boosted spending 7%. The primary drags came from specialty retailers (-10%) and “other” types of retail stores (-14%).